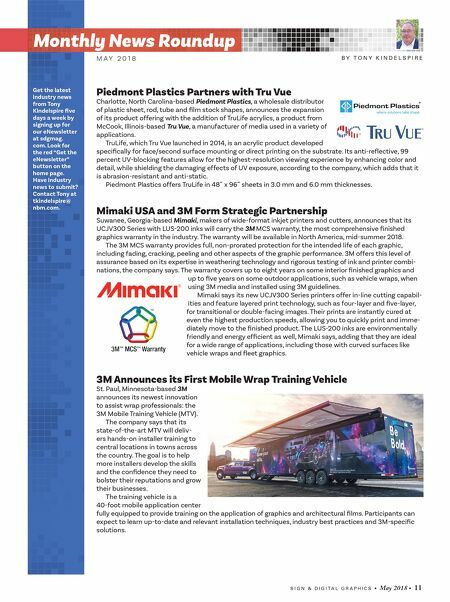 S I G N & D I G I T A L G R A P H I C S • May 2018 • 11 Monthly News Roundup B Y T O N Y K I N D E L S P I R E M A Y 2 0 1 8 Piedmont Plastics Partners with Tru Vue Charlotte, North Carolina-based Piedmont Plastics, a wholesale distributor of plastic sheet, rod, tube and film stock shapes, announces the expansion of its product offering with the addition of TruLife acrylics, a product from McCook, Illinois-based Tru Vue, a manufacturer of media used in a variety of applications. TruLife, which Tru Vue launched in 2014, is an acrylic product developed specifically for face/second surface mounting or direct printing on the substrate. Its anti-reflective, 99 percent UV-blocking features allow for the highest-resolution viewing experience by enhancing color and detail, while shielding the damaging effects of UV exposure, according to the company, which adds that it is abrasion-resistant and anti-static. Piedmont Plastics offers TruLife in 48˝ x 96˝ sheets in 3.0 mm and 6.0 mm thicknesses. Mimaki USA and 3M Form Strategic Partnership Suwanee, Georgia-based Mimaki, makers of wide-format inkjet printers and cutters, announces that its UCJV300 Series with LUS-200 inks will carry the 3M MCS warranty, the most comprehensive finished graphics warranty in the industry. The warranty will be available in North America, mid-summer 2018. The 3M MCS warranty provides full, non-prorated protection for the intended life of each graphic, including fading, cracking, peeling and other aspects of the graphic performance. 3M offers this level of assurance based on its expertise in weathering technology and rigorous testing of ink and printer combi- nations, the company says. The warranty covers up to eight years on some interior finished graphics and up to five years on some outdoor applications, such as vehicle wraps, when using 3M media and installed using 3M guidelines. Mimaki says its new UCJV300 Series printers offer in-line cutting capabil- ities and feature layered print technology, such as four-layer and five-layer, for transitional or double-facing images. Their prints are instantly cured at even the highest production speeds, allowing you to quickly print and imme- diately move to the finished product. The LUS-200 inks are environmentally friendly and energy efficient as well, Mimaki says, adding that they are ideal for a wide range of applications, including those with curved surfaces like vehicle wraps and fleet graphics. 3M Announces its First Mobile Wrap Training Vehicle St. Paul, Minnesota-based 3M announces its newest innovation to assist wrap professionals: the 3M Mobile Training Vehicle (MTV). The company says that its state-of-the-art MTV will deliv- ers hands-on installer training to central locations in towns across the country. The goal is to help more installers develop the skills and the confidence they need to bolster their reputations and grow their businesses. The training vehicle is a 40-foot mobile application center fully equipped to provide training on the application of graphics and architectural films. Participants can expect to learn up-to-date and relevant installation techniques, industry best practices and 3M-specific solutions. 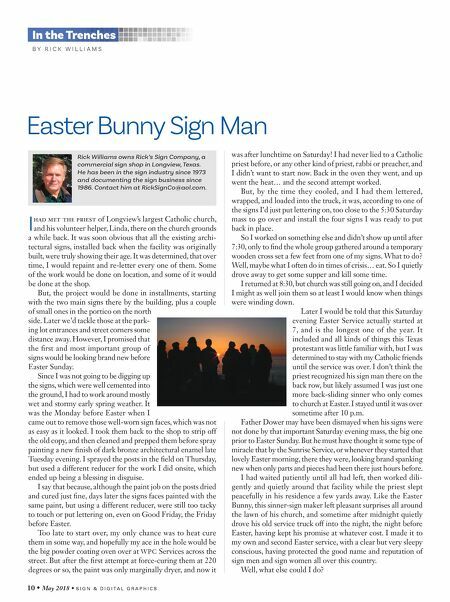 Get the latest industry news from Tony Kindelspire five days a week by signing up for our eNewsletter at sdgmag. com. Look for the red "Get the eNewsletter" button on the home page. Have industry news to submit? Contact Tony at tkindelspire@ nbm.com.